By taking pairs of speakers away from their traditional, domestic positions – on the floor or sitting on bookshelves – and mounting them up on the wall in multiple, modular formations, Bang & Olufsen’s new BeoSound Shape system is the wirelessly connected music conduit as art installation. An immaculately rendered integration of audio innovation and contemporary interior design the BeoSound Shape’s visually and aurally elegant, three-dimensional, hexagonal panels are upholstered in a selection of ten different acoustically transparent fabrics, four of them wool fabrics by Kvadrat, and can be arranged into tonal patterns and aural tessellations to suit the mood of the owner, or the shape and décor of a room. Support for the luxury tech specialist’s new product includes an online tool that helps users design patterns and colour schemes for the ‘band on a wall’ panels with configuration suggestions for best acoustic effect, maximum visual impact and optimum well-being. ‘The panels also absorb noise to improve ambient, indoor acoustics. To demonstrate the versatility, design and graphic possibilities of B&O’s BeoSound Shape system, Wallpaper* is inviting creative talents to test the speakers in their work and home environments. Johanna Grawunder is a designer and architect based in Milan and San Francisco. Her work spans a broad range of projects and scales, from architecture and interiors to limited-edition furniture and lighting for galleries in Europe and the USA. She also designs products for the likes of Flos, Boffi, B&B Italia and Salvati. Johanna worked with Sottsass Associati from 1985-2001, becoming a partner in 1989. At the Sottsass Studio she was primarily involved with architecture and interiors, co-designing with Ettore Sottsass many of the firm’s prestigious projects. In 2011, she opened her own studio developing a collection of lamps using repurposed and up-cycled industrial artefacts; stamped-steel earthquake brackets, extruded aluminium angles and a traffic light. Refining these iconic shapes through sandblasting, powder-coating, etching and anodising, new and unexpected forms come to light. W*: A lot of your work involves large-scale light installations. How did arrive at light as your preferred medium? JG: Having trained as an architect and worked for many years with Sottsass Associati, at a certain point it occurred to me that architecture is very much about dealing with natural light; that the devices of architecture (windows, skylights, porticos, courtyards) are all about filtering and controlling natural light, and that the history of architecture has spent 5,400 years playing with natural light and only about 100 years dealing with man-made light. That was exciting to me, the idea of integrating man-made light into architectural design, which then lead to large-scale light installations. I am also a child of southern California: the freeways, with their illuminated billboards and signage, the sparkle of buildings at night, the general luminous artifice of the man-made environment. Later, when the digital world became my world too, with the luminous colours of the computer screen, colours that never existed before in nature, then I decided I wanted to use this ‘new’ light as a construction material, to make spaces and objects that have a different dimension, an added quality. Since artificially-generated light is hard-wired to technology, do you find that you alter your technique and approach when new advances in light technology are made? I am very interested in new technology, but I do not use technology for technology’s sake, because that would be building in a guaranteed obsolescence, which I find sort of sad. If a design depends on its technology to be compelling or interesting, and then that technology is either superseded or becomes ubiquitous like a gadget, then the magic is gone. To paraphrase Allen Ginsberg, one god is not enough. The god of technology is not enough in itself. I like to use the proper technology for the proper solution, just as I like to use the proper material for a specific form. New technologies become inspiring and important when they allow one to design and make new forms, effects and colours that previously could not exist, but in a timeless dimension. You have studios in both San Francisco and Milan. Are you aware of the different qualities of natural (and artificial) light in those two locations? And if so, does it affect the way you live and work? San Francisco is famous for, among other things, its beautiful, crispy natural light. It is a very specific type of yellowish, bright light that filters in, I suppose, from the Pacific Ocean, and the rolling hills, and the competing fog. So yes, I am very aware of the light in San Francisco. Also, San Francisco is the world’s technology hub. Milan has a peculiar light, especially in summer. It’s a hot, lazy pink light that washes over the city and it’s really lovely and soothing. Also, Milan is the world’s design hub. Can you explain the inspiration for the piece you have created for Wallpaper’s BeoSound Shape project? 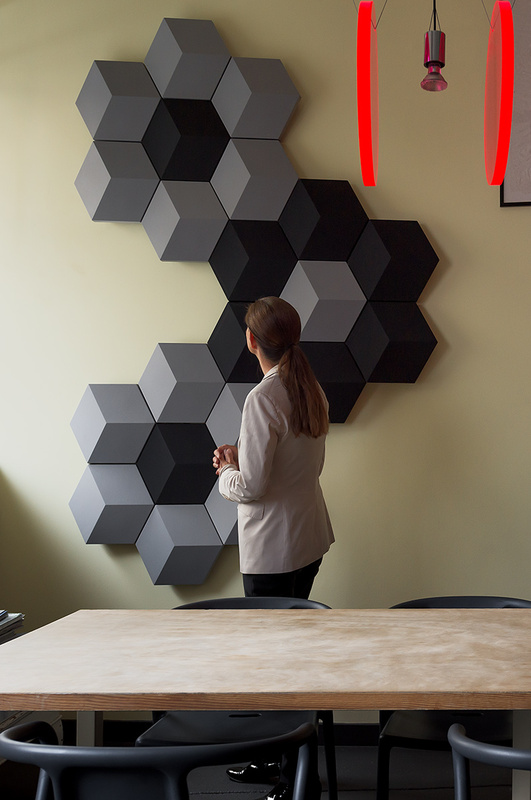 The hexagonal geometry of the BeoSound Shape is very interesting because you can make totally abstract shapes and architectural textures that look contemporary and integrated in any space. That said, I wanted to try to use the module to make something less abstract, something even symmetrical or representational. I wanted to break away from abstract textures and design a composition that would be more of a protagonist in the space. A thing. The final design is a bouquet of flowers, sort of Warholesque in scale, yet still architecturally subdued in colour. In the past you have described some of your design work in terms of architectural shapes. Do the silhouettes of the BeoSound Shape pieces have a similar architectural quality? The elements are basically like hexagonal building blocks, so they are very architectural. It will be interesting to see the different compositions using the system as time goes on. I had many different ideas and had to settle on one: flowers. But I could have happily made many different ones. There are endless possibilities, and as with any building system, the problem is not the block, but what you do with it. You worked with design legend Ettore Sottsass. How did he influence your own work? I worked with Ettore for 16 years and he had a huge and transcendent influence on my work and my life. He taught me how to pay attention to what I pay attention to – for example, to mine my American roots and my fascination with certain sub-cultures, including ‘technology’ and the contemporary landscape. When I started working with light, he understood immediately that this might be a part of what I knew intuitively because of my particular experiences growing up, and of my tendency towards a sort of austerity and economy of gesture. He used the expression ‘manmade light’, which I have adopted, instead of ‘artificial light’. Somehow that term brings humanity to an otherwise soulless abstract technology. What are your favourite examples of light sculpture, and also your favourite sounds? I love to find unexpected acts of lighting ‘violence’: for example, a neon blue bank sign that is just way too strong and hurts your eyes when you look at it. That kind of thing cracks me up. But I also appreciate city lightscapes consisting of many hands, many different technologies and many designs built over many years, all co-existing weirdly yet harmoniously. Hong Kong and Manhattan come to mind, but also San Francisco as seen from the Golden Gate Bridge. It sounds picturesque, but on a clear night, it really is a spectacular light show. My favourite sounds are emotional sounds: ocean waves crashing against the shore, a basketball arena full of screaming fans, and, embarrassingly, marching bands. But there is also always music on somewhere, and music really becomes the soundtrack to one’s life. I can remember what I was listening to when I designed certain projects. For BeoSound Shape I was listening to Chris Thile and Brad Mehldau. How does the way a room is decorated and designed have an effect on its acoustics, and what mistakes do people make when lighting their homes? The way a room is designed is obviously very influential on the way it sounds. Hard surfaces are different to soft surfaces, and angles and geometries have a lot to do with what you hear and don't hear. But it could be that sound, like light, is also a very subjective quality. My preferred lighting is probably different to yours. My preferred sound is also different. As with all senses, maybe there are norms but no absolutes, so flexibility is a good quality to embrace. How do you like to listen to music? What is on your playlist at the moment? I listen to music in my studio and when I walk around town running errands. Recently I’ve been listening to a lot of jazz. There is something about the asymmetry of jazz and the ingenious process of jazz improvisation with its infinite variations on a melody. It is such an emotional, pure artistic experience. How important is it that technology blends into the living space rather than stands out? Some people want to showcase their technology and others want to put it in walnut cabinets. So producing something that is performance-based to satisfy the ‘techies’ and beautiful enough to satisfy the ‘walnuts’ is a noble goal. The BeoSound Shape is a good example of high-technology performance with soft design. To demonstrate the versatility, design and graphic possibilities of Bang & Olufsen’s BeoSound Shape system, Wallpaper* is inviting creative talents to test the speakers in their work and home environments. Sophie Ashby, of interior design consultants Studio Ashby is based in West London. Working on both domestic and commercial projects her aesthetic is contemporary British; clean and eclectic incorporating modern design and quirky vintage pieces. Sophie Ashby was born and raised in Stellenbosch, near Cape Town. Her teens were spent in south west England, and she then broadened her design vocabulary with a BA in history of art at Leeds University, before studying interior design at Parsons in New York. Ashby is passionate about the arts, is a Young Patron of the Royal Academy, and has lectured at Central Saint Martins. After graduating from Parsons, Ashby began her career as an apprentice to Victoria Fairfax, an internationally acclaimed classical interior designer, from whom Ashby garnered her love of antiques, an understanding of colour and her sense of proportion. She then went on to head up the interiors team at Spring & Mercer, a small creative agency, where she had the opportunity to develop her own unique sense of style and learn about the wider responsibilities of running projects. In 2014, at the age of 25, Ashby founded her own interior design practice Studio Ashby. Starting with just a laptop, no investment and working from cafes, Ashby acquired one client, which quickly swelled to three. Studio Ashby has now grown to be a team of twelve working out of a studio in Notting Hill. Studio Ashby creates spaces with a unique identity. 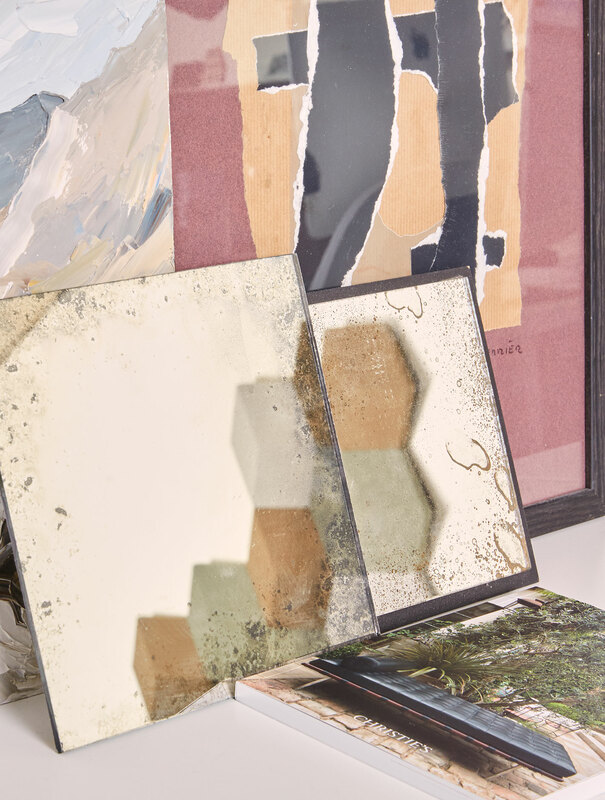 Ashby’s aim is to bring authenticity to each project, not only in the selection of furniture, lighting and art, but also in the use of a natural palette of materials and textures. Unswayed by the passing dictates of fashion, Ashby draws on her love of antiques, colour, contemporary art, modernist furniture, photography and her latest discoveries to deliver an eclectic richness to each interior. Studio Ashby’s relationships with artisans and craftsmen, as well as extensive resources and continual foraging, play an integral part in developing each project. Humour and a love of objects with an explicit narrative result in a carefully balanced body of work made up of cohesive spaces with a sense of honesty. The studio’s roster now includes a townhouse on Hyde Park, new residential development One Crown Place, a large duplex penthouse in Battersea, a Nigerian restaurant in St James, a hotel in the Winelands of South Africa, a riverside villa in Languedoc, a beach house in Devon, and a rambling country house in Somerset for the actress Gabriella Wilde and her young family. Studio Ashby were shortlisted for International Interior Designer of the Year in 2015, 2016 and 2017. W*: What is your favourite sound? SA: A breeze rushing through long grass in the African bushveld. Sound is inextricably linked to technology. Do you find that more and more clients are expecting sound technology to be integrated into their living spaces? And how do these demands impact on the way you design a space? We certainly are receiving more requests from our private and commercial clients for AV to be fully integrated into their living spaces. It’s important that a bespoke service such as interior design leaves no stone unturned and makes sure that every detail is thought of and considered; our client’s homes should be seamless, everything should work perfectly and much of that is about function and making life easy and enjoyable. These demands mean that as designers we need to be fully aware of our client’s requirements from the start of a project so that we can incorporate any gadgetry into the design of each piece. This is usually done by asking a multitude of quite personal questions about how they life to live, how they spend their time and what they do, in which space, and when. For example, most of our private clients have spaces within their homes which are used at different times of day and therefore need to create different atmospheres to suit; many clients don’t want speakers in their bedrooms as it’s a stage for calm and tranquility whereas some invigorating music whilst showering is what gets them ready for the day! Can you explain how the way a room is decorated and designed has an effect on its acoustics? Room acoustics are really important as I think interior design is about engaging all the senses. It’s about how it smells and what you can hear as much as it’s about what it looks and feels like. Lots of hard finishes create bad acoustics in a room. I always make sure there is a balance of hard and soft finishes. Things like curtains, soft wall panelling, rugs and upholstery help to absorb sound and reduce echoes. This is particularly challenging in restaurants as the finishes need to be harder for durability. You work on both residential and commercial projects. How does your approach to each project differ? I believe that life can be improved through a connection to art and design – it’s a modernist approach and one that I think is hugely relevant today. In a heavily saturated market, I have found that an eclectic approach, a warmer, luxe yet approachable design with a strong sense of home, is what my company, Studio Ashby, is becoming known for, particularly within the residential arena. A public project has to work within a different set of constraints to a residential project, but I enjoy the challenge. With a public project, the research into the location and area is more integral to forming the core of a concept, whereas, with residential projects, there is more freedom as instead the focus is on how the inhabitant wants to live and what they want to be surrounded by. I think there are more similarities than differences, and, ultimately, our mission to create spaces with lasting appeal, timelessness, authenticity and originality unifies the creative process. For me it’s important that it blends in and becomes, in a sense, invisible. Art should be the primary focus. You talk a lot about art influencing your work. Can you give some examples? Picasso said ‘the purpose of art is washing the dust of daily life off our souls’ and this sums it up perfectly in my mind. I believe the art collection is the soul of a home. Much of the magic of an interior comes from the authentic and the surprising, and playing with art is the simplest way to evoke those feelings. The power of a photograph, a painting or a sculpture is awesome – awesome in the old-fashioned sense of the word because it has the ability to reach out and talk to you. It is the magic ingredient in creating a strong sense of home. What are typical demands from clients in regards to sound and speakers? Usually something easy to use, seamlessly integrated and uncomplicated. What was your inspiration for the piece you created for Wallpaper’s BeoSound Shape project? I wanted to create an abstract shape using the speakers and work in a green tonal palette to complement the plants we have in the studio. To me, green is a neutral colour and can work well with anything. Describe your first impressions of the BeoSound Shape units? How could you integrate them into a home environment? They were really fun to work with. I love the fact that you can use Kvadrat fabrics to create something unique, and there are infinite combinations of shape, form and colour. There’s something for everyone. The design of the BeoSound Shape speakers sends out a clear message that functional things can also be aesthetically pleasing. Have we seen the back of the ugly hi-fi stack? I hope so! I think everything that we put in our home needs to work harder these days. As we all become more sophisticated and aesthetically aware of our personal environments, the urge to make everything beautiful and visually pleasing grows stronger. Where do you like to listen to music? What is on your current playlist? I listen to music everywhere I go. Complete silence in the studio is not allowed – it makes me feel on edge. We listen to a lot of world music, particularly funk and Afrobeat. I also love Oumou Sangaré, Alabama Shakes, Leon Bridges, Blood Orange, How to Dress Well, Swim Deep and Rhye.